With Eid Break round the corner, Carlton Downtown Dubai has rolled out an exclusive Eid promotion for UAE Residents seeking a unique experience. During the Eid holidays UAE residents get to enjoy a special rate of AED 444 for single or double occupancy with breakfast. Surrounded by Dubai’s landmarks and innovative architecture, the Carlton Downtown hotel is the best location for business or pleasure. 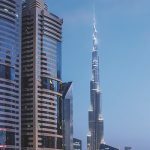 Brilliantly located in close proximity to the World Trade Center, DIFC and Downtown Dubai, the 47-storey spectacular tower features 357 rooms (275 suites and 82 spacious rooms). Enjoy seven dining and entertainment venues including Zephyr, the highest rooftop restaurant and lounge in Dubai. Hold productive meetings and successful events in the versatile meeting and event spaces. Alternatively relax and rejuvenate at the O2 Spa or chill out in the rooftop pool with spectacular panoramic views of the Burj Khalifa, Arabian Gulf and Downtown Dubai.